Happy Monday! We’re back with our series ‘Meet A Local Monday”. We’re thrilled to have met the charming Ryan Harms from Union Wines Company, known for its cleverly designed canned wine. After eight years of working in wineries around Oregon’s Willamette Valley, Ryan had a vision of opening his ideal winery and felt there was room to do it a bit differently, with a stellar result. Where did you get the idea to set up your own wine company? I’ve worked for some great Oregon wineries throughout my career. In so many cases, my friends wanted to support us, but simply couldn’t afford to. details, while leaving the fussy parts behind. By being efficient about everything, from how we set up the winery to how we make wine, we knew we could successfully create that marriage of craft and small-scale manufacturing. We chose the name Union to honor and bring together the diversity, spirit and character of Oregon that we love. 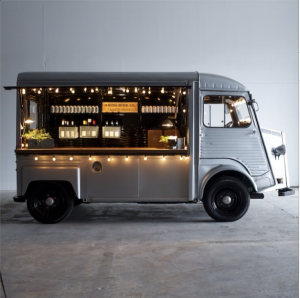 Tell us about your wine truck! restored to help us bring our wines out of the country and into the city. We were really drawn to the utilitarian design, functionality and old mechanical feel of the Citroën H Van. Embodying our pinkies down philosophy, it was love at first sight. If you’ve followed our story, we’re pretty proud of the place we call home, and we’re excited to connect to the “food cart culture” that Portland has become quite famous for. So far, the Tasting Truck has made appearances at a number of events around the Portland area. And, it always seems to turn heads driving down the road! We’re also hopeful to announce a pretty cool Portland hot spot as the Tasting Truck’s “home base” before too long. At the end of the day, wine is just a beverage. And then it becomes part of something greater. It brings people together over a meal, for celebrations big and small. And that’s incredibly satisfying to me. Part of what makes winemaking in Oregon exciting is that it’s a constant challenge. Oregon’s climate (lots of rain, cool temps, short growing season) doesn’t make this a walk in the park. The moment you try to get away with something here, Mother Nature will remind you why it’s difficult at times to grow grapes in Oregon. We’re not Burgundy. We’re not California. Oregon wines have a distinct profile. They have good vibrancy and crispness. Our wines taste like the agriculture that surrounds us. Then you toss in the fact that we wholeheartedly love where we live. We love that Oregon is truly a unique community built on individual strengths, and is a haven of makers and doers who pay particular attention to their craft, be it food, clothing, or in our case, wine. It’s also a place where, in a sense, we have it all – wild open spaces that meet mountains, industrial cities and farmlands, all brimming with inspiring artists who are passionate about their craft. We are amazed on a daily basis at what it’s like to live and work within this unique community. The Pork Belly Cubano from Bunk Sandwiches cures anything.